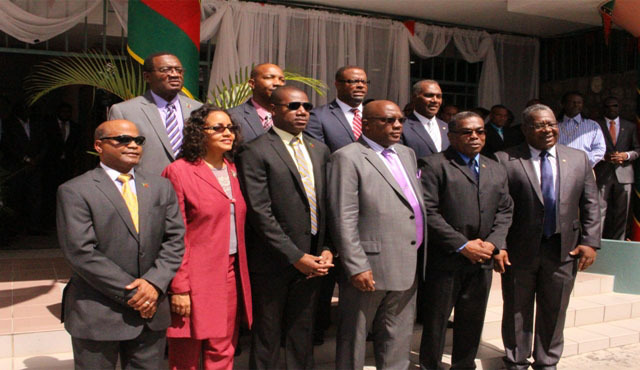 Basseterre, St. Kitts, Tuesday, 12th February, 2019, (MyVueNews.com) – With talk of election already in the air, the ruling coalition administration in St. Kitts and Nevis, is using the occasion of the 4th anniversary of its 2015 election, to drum up support for its initiatives while in government. It was on 16th February, 2015 that the united team of PAM, CCM and PLP, pulled off an upset victory, ending a near 20 year run by the Labour Party, led by former Prime Minister, Denzil Douglas. However, with the term approaching its final stretch, more effort is being invested in the celebrations this year, to demonstrate to the electorate that the administration has delivered on its promises as outlined in its manifesto. Using the theme, “making dreams a reality in each community”, the celebrations kicked off on Monday, 11th February, with a tour of the Paul Southwell Industrial Complex in East Basseterre. The government has been touting what it deems to be its success stories in various areas, including reaching the 1 million mark in tourist arrivals in 2018, opening of the East Bus Terminal, construction of a second cruise pier, rehabilitation of Old Road, construction of various hotels, building of a soon to come new Basseterre High School and others. St. Kitts, in recent years had gained the reputation of being the leading exporter of manufactured goods in the OECS, and the small industrial plants there, have accounted for the employment of hundreds of Kittitians, mainly women from the rural parts of the island. Other important vents slated to be held include a National Youth Forum at the Royal St. Kitts Hotel on Thursday, 14th, Volunteer Day, on Saturday, 16th, Expo-Health, College and Career Fair, on Friday, 15th and a series of public consultations on each island, starting on Tuesday, 19th. There will also be church services on Nevis and St. Kitts.